“Fez is like a living museum,” an acquaintance tells me over dinner on my final night in the historic city. She’s hardly exaggerating — every cobbled lane, ancient rampart, and old-world mechanism that might be re-created for a kitschy Ye Olde Medieval Faire in your hometown is an everyday reality here. Time seems to have stopped somewhere in the Middle Ages in Fez, provided you choose to ignore the symphony of cell phone ringtones that emanate from the winding alleys. It’s an unusual place, only a few hours and yet a world away from its far glitzier sister, Marrakech. But unlike Marrakech, Fez seems devoid of both foreign accents and of pretension. It’s well worth spending many a day getting lost amid its winding labyrinth. And get lost you will. With 9,000 proper streets and 40,000 dead ends, the fact that you will lose your way in Fez’s medina is a foregone conclusion. But it’s also half the fun: there’s no better way to immerse yourself in the fabric of the city’s daily life than to meander through its neighborhoods as residents cart home bread and groceries for breakfast, cycle to work, stroll to the mosques for prayers, transport furniture via donkey, tote their soap and towels to the neighborhood hammam, sip tea on their stoops, and gossip in the alleys. But once you’ve soaked in the experience, it’s best to hire a guide for a proper tour — how else would you learn that the “new” part of the old city dates all the way back to the 14th century (and its older counterpart was founded in the year 808)? The ancient stone walls and weather-worn façades harbor a legion of fascinating tales and mysteries that are best unlocked with the help of an expert. Ask your riad or hotel or arrange an official one so you don’t succumb to the pleas of one of the hundreds of illegal touts that prey on tourists, and expect to pay about $30 for a private half-day tour for a group. For a more in-depth tour, consider booking the services of luxe tour operator Blue Parallel — they can hook you up with a local scholar for a more intellectually driven take on the city than you might get with most guides. Blue Parallel can also arrange for you to have a traditional tea at the home of a local family. 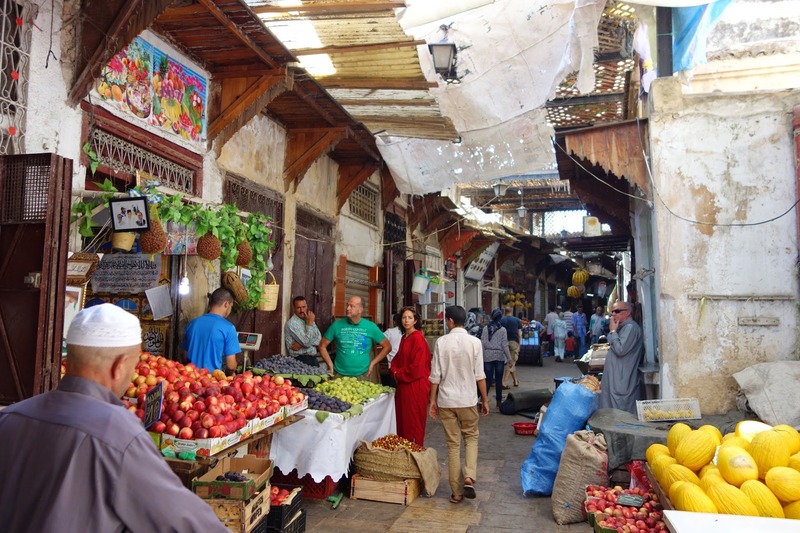 Our own guide, Hisham, starts us out in the Andalusian Quarter by the Bab Jdid, a relatively quiet, residential part of the medina that has a tranquil feeling, a far cry from the hubbub of the bustling markets. 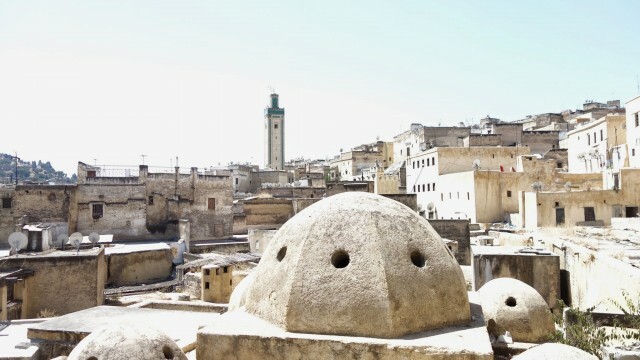 Each micro-neighborhood within the medina is centered around four requisite institutions, Hisham explains: a hammam for bathing; a mosque for the five daily prayers mandated in Islam; a fountain for each household’s water supply; and a bakery where residents purchase loaves or bring their own dough to heat over the communal fires. After a lazy hour immersing ourselves in the local routine, we emerge to the covered R’Cif market, the biggest in the city, with vendors hawking mounds of grains, vegetables, spices, eggs, and glistening baskets of olives. Hisham’s circuitous route takes us through various buzzing neighborhoods, each dedicated to a single craft: the dyers’ street, where men daubed strands of aloe vera silk in myriad vibrant colors; Nejjarine Square, where the carpenters work; Attarine Street, where perfumers ply their fragrant wares; and the tree-shaded Seffarine Square, where coppersmiths mould pots and urns with their mallets. From Seffarine Square, we follow a wood-paneled artery that plunges us into the heart of the medina. The walls were so designed to help guide blind students toward Karaouine University using their sense of touch, Hisham tells us. The university was founded by a woman in the year 889, making the institution presiding over 5.7 acres of medina real estate the oldest in the world — Pope Sylvester II, who studied there in the 11th century, is an alumnus. The mosque, built to accommodate 14,000 worshipers, was once the biggest in the world. 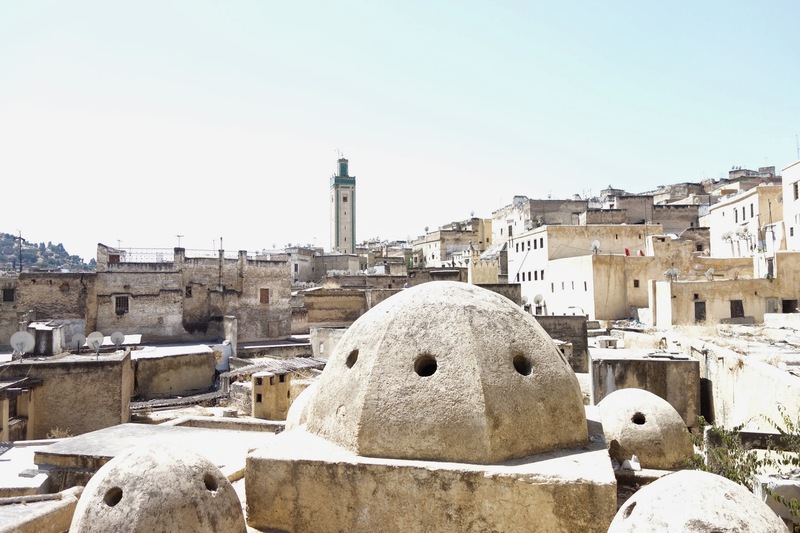 From there, we pass the ornate 18th-century mosque of Sidi Ahmed Tijani and the gilded tomb of Moulay Idriss before following our noses toward Fez’s famed tanneries. Here, people have been fashioning leather out of animal skins using the same stinky method (pigeon poop is a major ingredient) for seven centuries. 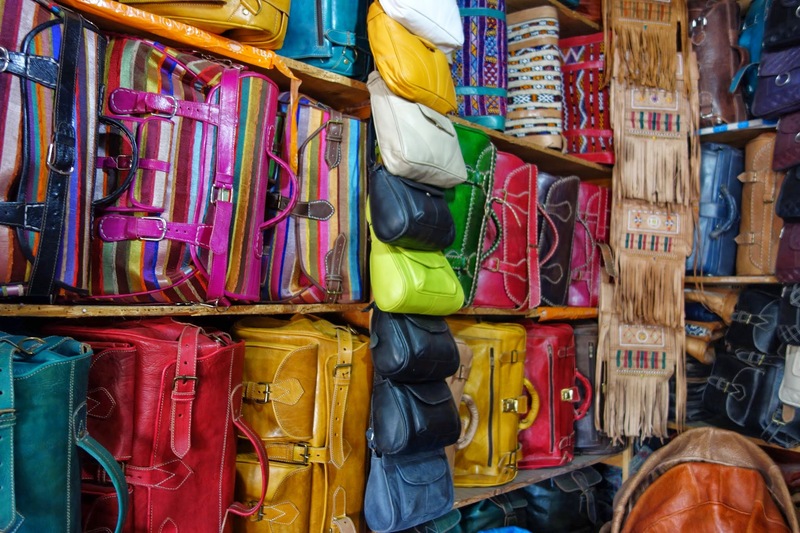 While the chic leather jackets and stylish clutches seen in the boutiques lining the terrace overlooking the tanneries are decidedly modern, the methods use to create them are quintessential Fez, as ancient as the city itself. Once you’ve finished your adventure and are ready for a break, make a detour to the trendy Fez Lounge, a tiny joint set on a quiet side nook just off one of the medina’s main drags. The stylish café could be in Madrid or New York, with plush couches, muted decor in shades of taupe and plum, and a smooth, jazzy sound track. It’s a great place to unwind with Morocan-style tapas, mint tea, and a sheesha pipe and ease your way back into the 21st century.